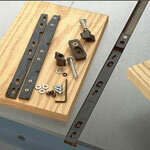 The ZeroPlay Guide Bar is a "One-Touch Calibration" miter bar that utilizes two stacked, interlocking half bars with opposing wedges to expand perfectly parallel to match the exact width of any Standard 3/4" wide x 3/8" deep miter slot, plus the Shopsmith (TM) or even the tricky General miter slot. The Zeroplay System will free you from any of the trial and error set-screw adjustments needed for other types of miter bars, plus it lets you easily square jigs to the blade or bit while securing the bars through the top of the sled. 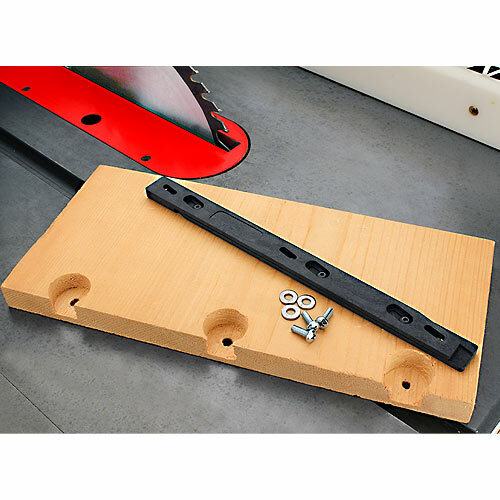 This highly adaptable system will allow you to build your own special cross-cut sleds, cutting jigs, measuring devices, and miter slot clamping and stop set-ups. Use the 9-1/2" long bar to build small cut-off jigs that are easy to carry and store, or custom space 2 or more bars in line to to build larger jigs. Includes: 1 Complete Guide Bar; Hardware; detailed Instructions; and Plans for several jigs and clamping devices. 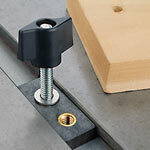 Miter Stops for limiting travel in the miter slot sold separately.